By ‘tagging’ each visitor it will be easier to identify them when they come back to the website in the future. This also helps to avoid mistakes being made. For example, if you tag all existing customers so that it’s clear within the data views, then it avoids potential embarrassment when a member of staff tries to contact a visiting company, treating them as a fresh prospect (because they weren’t aware it was an existing customer). You can tag company visitors from the Companies view by first of all clicking on the ‘Company Details + Set Category’ link in the options bar below each company, as shown below. When you click on that link you will see a ‘Current Category’ pulldown and clicking on the arrow gives you the options to select from. Then you select a category type for the company then click on ‘Update’. Below the tagged visitors are all other (untagged) visitors, listed in alphabetical order. 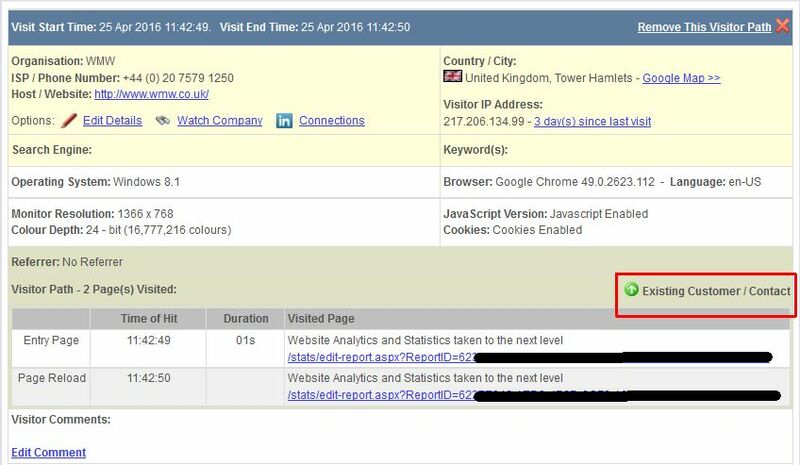 Your tagged visitors will only appear if they came to your website during the date range you have selected. Having tagged visitors, you will see from the detail level view that it’s made clear what type of visitor it was. For example, the screenshot below shows that the visitor is an existing customer/contact.